Evergreen has lowrise apartment style condos and townhouses available, prices beginning from the $200 000 area and up to $463 000. Evergreen is dominated by single-family detached homes, with a selection of attached residences as well, ranging between $100 000 and $1M+. Evergreen Estates also offers a selection of luxurious homes, worth between $1M and $2.5M+. Select your price range and/or specific Evergreen real estate below. 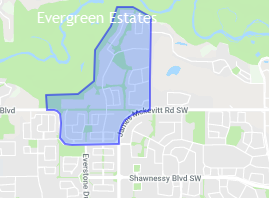 Evergreen is separated into two sections, the older, established homes being built in the 1980's and the newer homes being constructed in 1999 or later, each section having their own separate Community Association and street naming patterns. Located on the south border of Fish Creek Provincial Park, Evergreen is within walking distance of beautiful vegetation and outdoor recreation. Fish Creek Provincial Park is located in the north of the community and is an example of an urban setting being able to be ecologically friendly. Fish Creek is perfect for jogging, walking, picnics and fires. Full of wildlife and plant life, Fish Creek is a popular destination for those wishing to escape the urban city and escape into a garden paradise. Nearby Shawnessy has a shopping district, complete with restaurants, boutiques, and a cinema. The YMCA also has a facility in Bishop O’Byrne in Somerset, meeting all fitness needs with a weight room, a gym, and a swimming pool. Evergreen recently had a public elementary school opened, from K-4. Evergreen is located in Ward 13 and represented by Diane Colley-Urquhart on the Calgary City Council. Provincially, the community lies in the Calgary-Lougheed riding and represented by Dave Rodney and in the federal riding of Calgary Southwest and represented by Stephen Harper, current Prime Minister of Canada. Evergreen is serviced by the Shawnessy LRT Station on the Somerset-Bridlewood/Dalhousie line. Schools for specific Evergreen homes, please refer to the designated schools search tool on the Calgary Board of Education and Calgary Catholic Designated School websites. For a Report Card on School Rankings of Calgary Schools get in touch with one of our Evergreen Real Estate agents. Evergreen School will be a place of innovation. Students will use 21st century learning skills. Our students will have a strong foundation in literacy and numeracy. We know that if they develop these foundations, they will have less difficulty as they advance through school. More-over our students will engage in rigorous, high level thinking tasks that are multi-disciplinary. CBE is pleased to be opening Marshall Springs School for the 2017-2018 school year. Marshall Springs School will offer Grade 4 to Grade 8 for the 2017-2018 school year and will expand to Grade 9 for the 2018-2019 school year. Our Lady of the Evergreen Catholic School caters to the Catholic educational needs of students from the Southwest community of Evergreen from Kindergarten to the sixth grade.